There is a new feature both Microsoft Hyper-v and Vmware present in their latest version of product, that’s Memory compression. How does Memory compression work for Hyper-v is still an unknown but for Vmware vSphere 4.1, it’s pretty easy to understand. This post is dedicated for Memory Compression and I hope I can give you a easy explanation. There are always challenge for Vmware to reclaim free host memory from VMs because Microsoft doesn’t share internal index file to tell Vmware which memory pages are free. All Memory used by VMs are always aggregates and eventually it will bust up if you overcommitted memory on your host. So Vmware develop following technologies to work around this issue. One of biggest advantage comparing is Transparent Page Sharing. Basically, vmKernal scan most memory pages of VM sitting on the same host. It divide memory page as small piece (4kB) and generate a hash signature for each 4KB block. 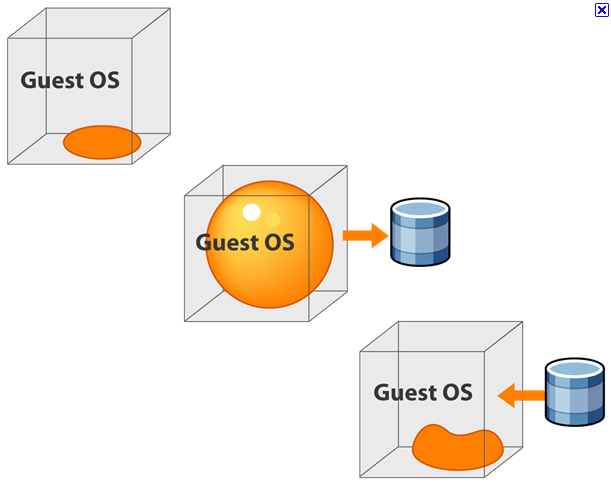 If there are more than one identical blocks on the host physical memory, Vmware keeps one block and free rest of blocks to host. 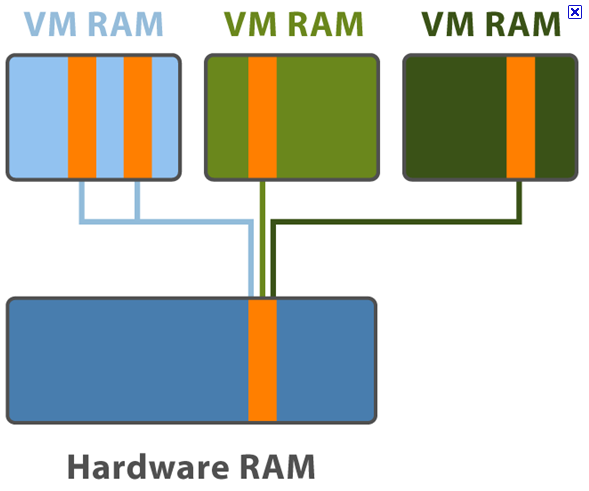 The exception is if you use hardware-assisted memory virtualization with large index table, Vmware doesn’t do page sharing till host memory is overcommitted. The block size and scan schedule are adjustable. Ballooning is used via Vmware Driver installed in the OS. This driver is still in the Kernel level and will try to claim memory when your host memory is short. It pins memory pages of VM and tell Host to use those pined memory as free memory. Unlike Sharing pages, it’s not proactive action. Swapping is a bad bad choice. 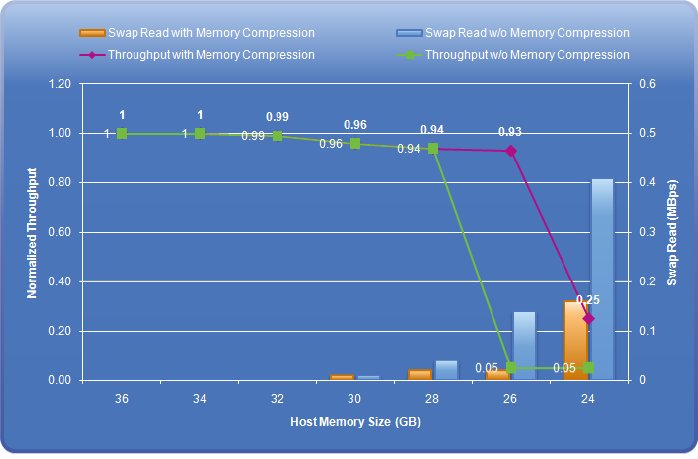 If your VM start to swap memory to physical disk, your VM performance will have dramatic impact. This is very last result of Vmware try to make VM still alive. Here it is. 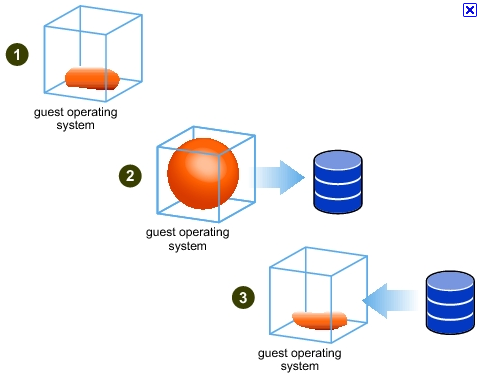 New technology of vSphere 4.1. It’s not something you will use everyday, it’s a technology which gives your VM another last breath before it sinks with swapping. Let’s see how it works. The idea of memory compression is very straightforward: if the swapped out pages can be compressed and stored in a compression cache located in the main memory, the next access to the page only causes a page decompression which can be an order of magnitude faster than the disk access. With memory compression, only a few uncompressible pages need to be swapped out if the compression cache is not full. Basically, when Swapping is about to happen, VM compress part of memory, which will be swapped out to physical disk, to it’s self memory space (not host memory ). It divide VM swapping memory to 4KB and tried to compress them to 2KB. If compress success, then, you can save 50% space, if it fails, VM still swap the original 4KB to physical disk. Therefore, it may or may not work 100% for all swapping memory pages. Even it can compress everything, please be aware it’s using it’s own VM memory space not host memory, which means it can’t use all VM memory. In default, that’s 10% of VM memory can be acted as Memory compression Cache. No other options will happen to those compressed memory. Anything happens, VM needs to uncompress them first and do other action next. Let’s see a real case. If you notice those two lines, the gap between 28GB and 24GB memory, the memory compression kept throughput with very 6% performance difference. If we look the two bars with swapping read, you can clearly see even with the worst case, memory compression still manage to take more than half of load of Swapping and make VM live longer and operate-able. Memory compression give your VMs a last chance to struggle on operation level. It’s better than nothing, isn’t it?